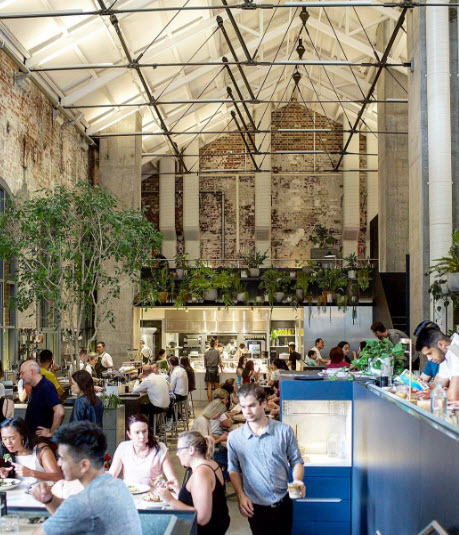 Since 2006, across multiple venues (including Liar Liar, Three Bags Full, Two Birds One Stone, Top Paddock, The Kettle Black), Nathan Toleman and his partners, Sam Slattery, Ben Clark and Diamond Rozakeas, have consistently pushed the boundaries of what we understand the cafe experience to be. At Higher Ground there's a steamed market fish on the breakfast menu. There's a list of small plates that includes charred brussels sprouts, cured kingfish and a charcuterie selection. Waiters are dressed smartly in uniformed shirts. Long hair tied back. People walk in the door of the former power station and crane their necks. The ceilings are 15 metres high. Natural light floods in. There's a long, stainless-steel bar for brewing coffee and unusual teas, and for pouring wine and cocktails. The layout and atmosphere is inspired by Ace Hotel and Soho House in London and hip boutique hotels in New York that have an all-day feeling that goes from morning to night. After dark the mood changes as the operation melts into dinner service. A new menu is placed on the tables. The ceiling lights and lamps dim. There is an L-shaped mezzanine that overlooks the bustling ground floor. The upstairs level, which comes with its own barista station, is an unhurried lounge to read, work or eat a meal in.